Let’s carry on the Oreo loving/birthday celebration with another simple Oreo recipe. Last week I made Oreo brownies with buttercream frosting, originally pinned from Love from the Oven. I decided to make this recipe as easy as possible by using my favorite boxed brownie mix and some store bought buttercream frosting. Basically, you make the brownie mix as directed on the box and then add in half a package of crushed Oreos. Spread the batter evenly in a 13x9 pan. Allow the brownies to cool and then cut them into circles. I ended up using a drinking glass again. Then just simply frost with buttercream and top with crushed Oreos. The Verdict: These were delicious! I absolutely loved them. Such a simple way to jazz up a plain brownie. Also, I must say, the store bought buttercream was actually really good! Things to Note/Consider: The brownies were a bit difficult to cut into circles. I think it was because they were fudge style. Next time I make these, I’ll use the dark chocolate kind. It might make it easier to cut. Other than that, I wouldn’t change a thing! Prepare brownie batter as directed on the box. Crush half a package of Oreos (either in your food processer or with a rolling pin). 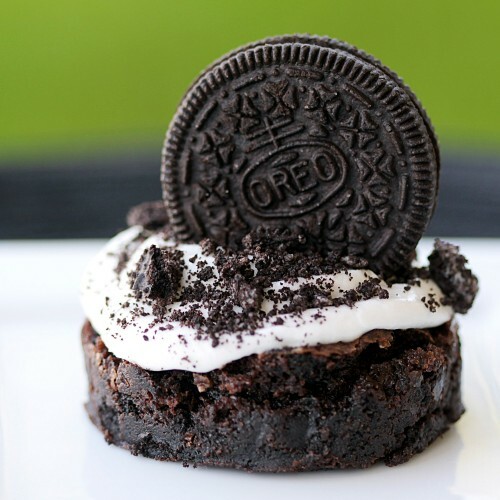 Mix the crushed Oreos in with the brownie batter. Bake brownies as directed on the box. Once the brownies are cooked & cooled, cut into circles. Frost with buttercream & top with Oreo crumbs.